(Piano/Vocal/Guitar Artist Songbook). 15 songs from one of the leading artists and composers in contemporary worship music, including the favorites: Amazing Grace (My Chains Are Gone) * Be Glorified * Holy Is the Lord * How Can I Keep from Singing * How Great Is Our God * Indescribable * Not to Us * Take My Life * We Fall Down * and more. 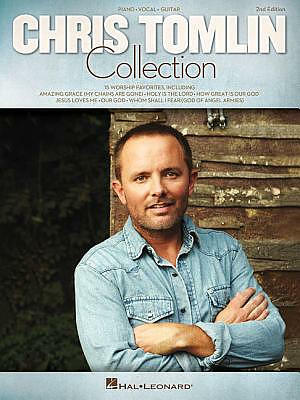 Chris Tomlin Collection Songbook was published by EMI in March 2008 and is our 26374th best seller. The ISBN for Chris Tomlin Collection Songbook is 9781423454670. Be the first to review Chris Tomlin Collection Songbook! Got a question? No problem! Just click here to ask us about Chris Tomlin Collection Songbook. Is this just a song book or is it full music for piano and guitar? A:It contains both piano music, as well as chords for guitar. Thank you for using the Q&A Forum.